The 2019 Iowa legislature convenes on Monday and odds are that lawmakers will consider a bill to make it legal to bet on sporting events. 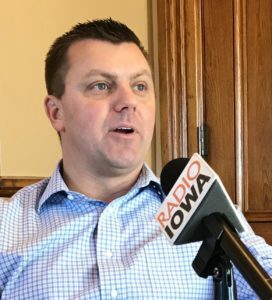 “I think we have a really good chance to get sports betting passed here in the State of Iowa this year,” said Senate Majority Leader Jack Whitver, a Republican from Ankeny who decides which bills get debated in the state senate. The U.S. Supreme Court ruled last May that all states may legalize wagering on sporting events. Over the past couple of years, casino industry lobbyists urged Iowa legislators to prepare for the Supreme Court’s ruling and set up a system that would give the state-licensed casinos authority run sports book operations. New Jersey and Delaware immediately legalized sports betting this past spring and Whitver says Iowa casinos seem the likely host for wagering on sports — if it’s legalized here. “We have a fairly good system set up with the casinos and our Racing and Gaming (Commission) overseeing gambling and so I think you’d largely use that structure as you look at how to implement sports betting,” Whitver said. Iowa Lottery officials say several of the state’s largest lottery retailers want the option of offering a sports lottery — similar. perhaps, to the one now legal in Delaware. Whitver said it “makes more sense” to have sports wagering managed by the casinos. Estimates indicate Americans illegally bet hundreds of billions of dollars on sporting events every year. Bills to legalize sports betting in Iowa have been introduced in the Iowa legislature since 2010, but none advanced beyond the committee level.